T-Mobile hopes to offer support for the newer iPhones' eSIM by the end of the year, according to a report from PCMag. The carrier is distributing training materials concerning its eSIM app to staff this week. 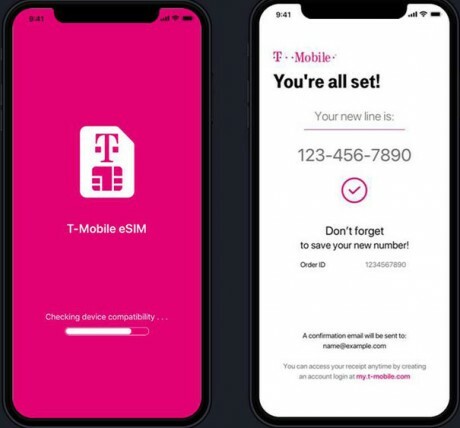 T-Mobile will allow iPhone Xs, Xs Max, and Xr owners to sign up for prepaid T-Mobile service on the eSIM using this new app. T-Mobile will continue to require physical SIM cards for primary lines and family plans. AT&T and Verizon's method for activating the eSIM requires users to visit a store or use a scannable QR code sent via the carrier. AT&T began allowing the eSIM today, and Verizon is expected to support the eSIM tomorrow. The eSIM is already supported by GigSky and Truphone. Sprint is not likely to support the eSIM until 2019. The iPhone XR goes on sale Friday, October 26, and Apple has revealed what it will cost to repair the device should it break. If the screen is broken accidentally due to mishandling, or if the screen breaks on its own, and the device isn't covered by AppleCare+, Apple will charge $199 to repair it.